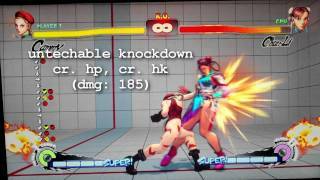 Back in 2011, DarkSydeGeoff posted a Cammy guide for Super Street Fighter IV: Arcade Edition. Watch the clip, which still applies to AE 2012, inside. Cross Counter TV has re-posted DarkSydeGeoff's Cammy guide from 2011. The guide was made for Super Street Fighter IV: Arcade Edition, but it still applies to version 2012.